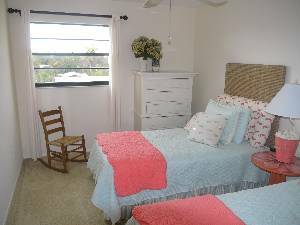 Beach Chic Retreat - Totally Redone 2 Bedroom at Coquina Condominium! NOW BOOKING FOR MAY 2013! See our specials! If you are searching for a richly styled, quiet hideaway with gorgeous views and easy access to the beach, look no more. 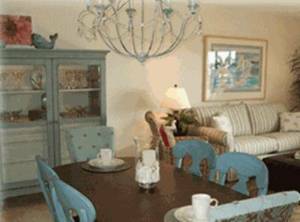 This extra spacious two bedroom condo is a fourth floor END unit with views of both the gulf and bay. The elevator opens up right at your door and no one will be walking by your windows as this is a corner unit. It features a full length lanai off the living room and master bedroom, a large master bath with two sinks, guest bedroom with twin beds, full guest bath, living/dining area, laundry, and full kitchen with Corian counter tops and white cabinets. 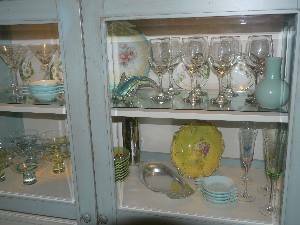 All furniture and decor are high quality and NEW including beds, linens, TVs, artwork, decor, stainless steel kitchen appliances, and everything in the well stocked cabinets. 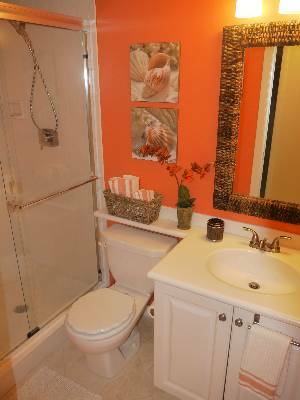 Fresh paint colors, gorgeous new tile in kitchen/living area and lanai with plush new carpet in both bedrooms. 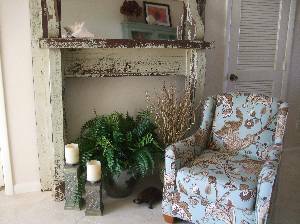 Shabby chic decor is cozy and inviting and even includes an antique mantle! Enjoy flat screen TVs in living room and master bedroom with free cable and high speed internet. Also included is free long distance calling anywhere in the US, Canada, or Mexico! 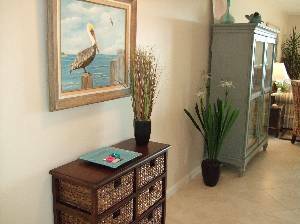 This condo is wonderfully located on Estero Blvd. within walking distance of great restaurants, the island movie theater, and Santini's shopping plaza. The island Publix grocery is just over a mile away and you can hop a trolley out front for 50 cents to Times Square and the public beach whenever you get the urge. The pool is very private with a cabana and eating area should you want to swim, sunbathe, or picnic. And then there's the beach! It takes less than two minutes walking to reach the widest, whitest part of Ft. Myers Beach. NO roads to cross! Walk in either direction for shelling, birdwatching, or just cooling your feet in the surf. We provide the beach towels, chairs and umbrella! NEW for 2012---a Tommy Bahama Beach Cart to carry your beach gear to the shore. It folds up for easy storage. This unit was totally revamped after the owners moved out and has only recently entered the rental market! We will work with you on rates to make it possible! Features a lighted china cabinet, drop leaf table for six, and unique chandelier. The queen sofa sleeper features an upgraded memory foam mattress, leather ottoman, matching chair and settee, and a rich Oriental carpet. 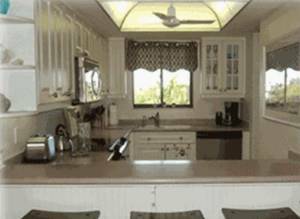 All new stainless steel appliances, Corian countertops, ample cabinet storage, all new dishes, cookware, and accessories. This cabinet has two levels of interior lighting and everything you need for an elegant evening. Use it as a night light when watching TV or relaxing in the living room. Storage drawers face the closeted laundry. Striking new tile throughout entry, kitchen, dining/living area and lanai. Unusual to say the least, this mantel and comfy chair add a serene viewing spot facing the lanai doors and the gulf. New twin beds, ample drawer storage and a full size closet. Everything about our week was fantastic. But what made it that way was the beautiful condo. Very nicely decorated and very comfortable. Beautiful view from the lanai. Convenient to everything. We stayed a month and had a great time in this condo. The owners are very helpful in making our time spent there a good experience. This was a great getaway, condo was perfect had everything we needed and was neat and clean. The condo is just a two minute walk to the beach, 5 minutes to the Tiki Bar and a 10 minute walk to the Holiday Inn. We are planning our trip back! 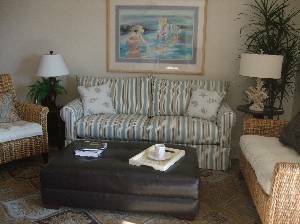 very nicely decorated and well equipped condo, very homey and comfortable...perfect lanai for eating drinking and just watching the sun sets over the gulf...good location, trolly stops right outside the building...20 min beach walk to grocery store...perfect little vacation. My experience with the Davis family was great from my intial inquiry through my stay at their condo. They provided me great information regarding their unit, directions from the airport, and nearby amenities. Their condo was beautiful and totally upgraded and equipped with everything I needed to make my stay comfortable. I was able to watch gorgeous sunsets over the Gulf of Mexico from my balcony. The kitchen was very nice and had everything I needed. The Master Bedroom was very spacious and had beautiful views. I would not hesitate to return. Cancellations and Refunds: Refundable damage deposit required.